Is there going to be a Countdown in your city? 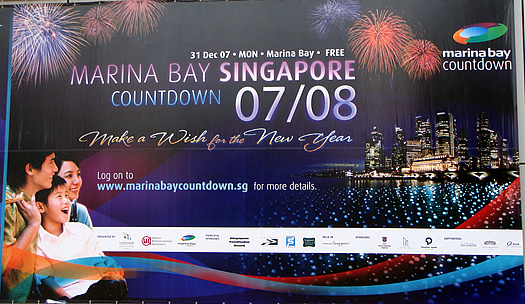 In Singapore, there will be the Marina Bay Countdown. There's going to be lots of fireworks. This photo was taken earlier today, at around noon. Everything seems to be ready. Waiting for the skies to turn dark. Where would you be tonite at the stroke of midnite? Well, for me, I will be in church, joining the many churches in Singapore that is having the Watch Nite service thanking the Almighty for the blessings of 2007. Have a very Blessed 2008! 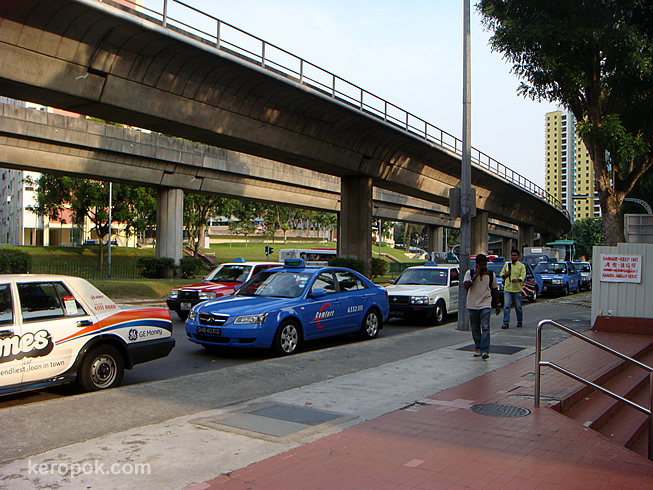 Just a few weeks ago, the taxi companies in Singapore raised their fares. Depending on where and when you take it, you might be paying up to 49% more. Whatever 'justification' the taxi operators are giving, many people don't buy it. I think the passengers are retaliating by taking less trips. This photo is taken a few days ago. 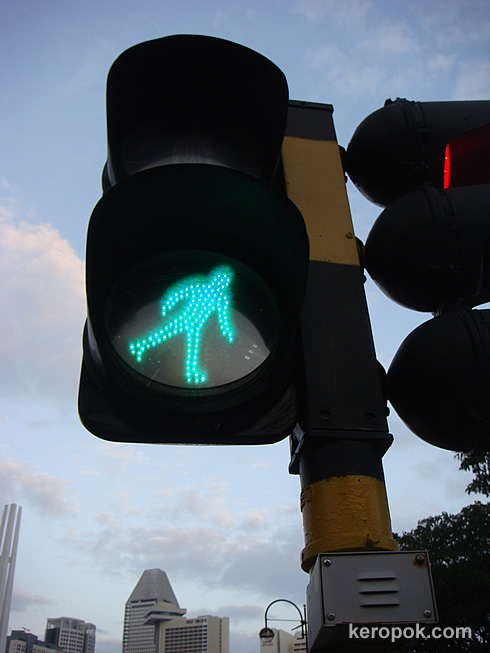 Many people have realized that it is now much easier to hail cabs. Taxi are lining up and there does not seem to be people taking it. Previously, it was the opposite. Long queues of people waiting, but no cabs. Is giving to charity one of the to-dos for Christmas for you? In one of the shopping centres down in Orchard Road, Paragon, a Charity Toy House was set up in aid towards the Straits Times School Pocket Fund. One could donate $20 into the box and go into the "house" and pick up a gift of your choice. The gifts are wrapped and they include animal-bags, scarves, wooden toys, blankets, pencils cases and height rulers. The nett proceeds go into the Straits Times School Pocket Money Fund. 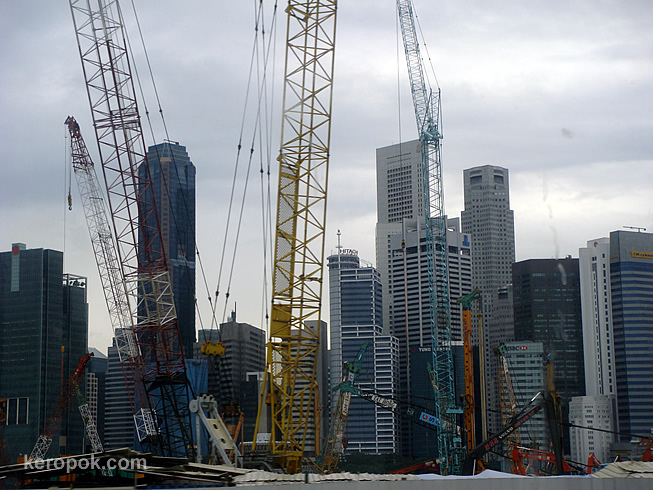 Those not living in Singapore, do you have something like that in your city? Spotted at a traffic light near the tallest hotel in Singapore. This green man was fixed slanted. It is as if it is walking down a slope. 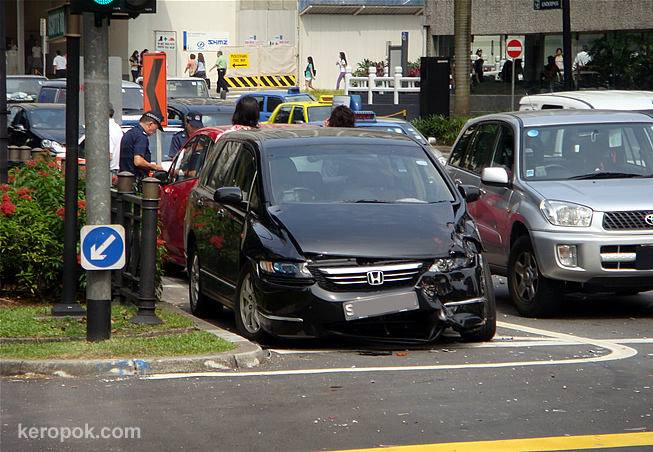 Someone said, hey, how can fussy Singapore get a traffic light that is not fixed properly. haha.. This big plaque was seen on the walls of the Victoria Theatre. 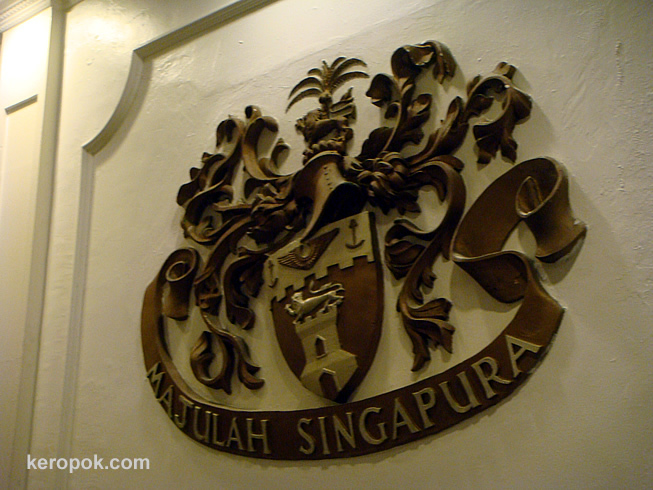 What is Majulah Singapura? It's the National Anthem of Singapore. Translated to English, it means Onward Singapore. Wishing all Muslim friends a Happy Eid Ul Alha! In Singapore, we call it Selamat Hari Raya Haji in the local Malay language. More photos from the Charity Concert yesterday. Actually it is also shown tonight. How graceful the ballerina is. ooo.. those toes must be painful! 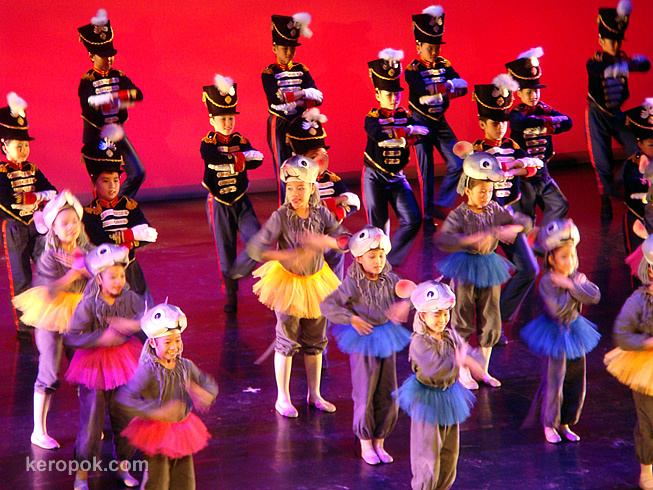 These kids posing as toy soldiers and mice is quite interesting! How much hard work they have put in! 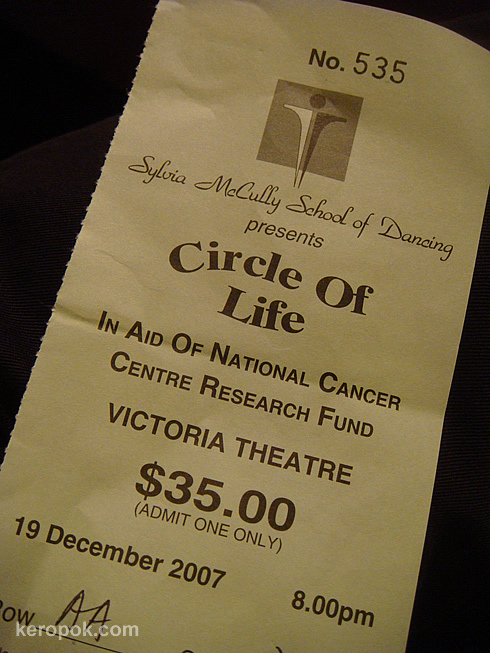 All part of the Circle of Life - In Aid of National Cancer Centre Research Fund. I was at a concert earlier this evening. 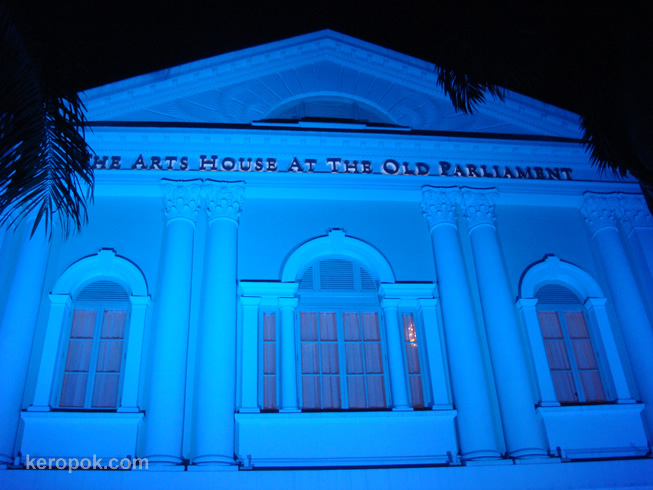 It was held at the Victoria Theatre and it is in aid of the National Cancer Centre Research Fund. It started at 8PM all the way till around 10.20PM. 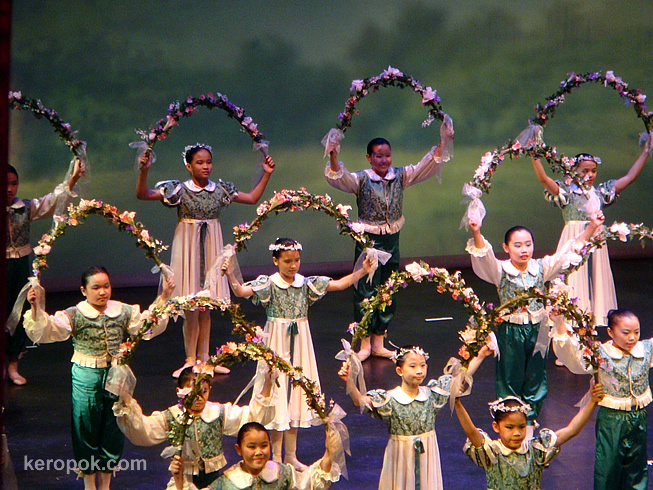 One of the many dances performed by students from the Sylvia McCully School of Dancing. When was the last time you attended a ballet concert? Was at Conrad Centernnial Singapore for a farewell lunch. Colleague's leaving us, after 9.5 years. We will miss him. All the best KP! 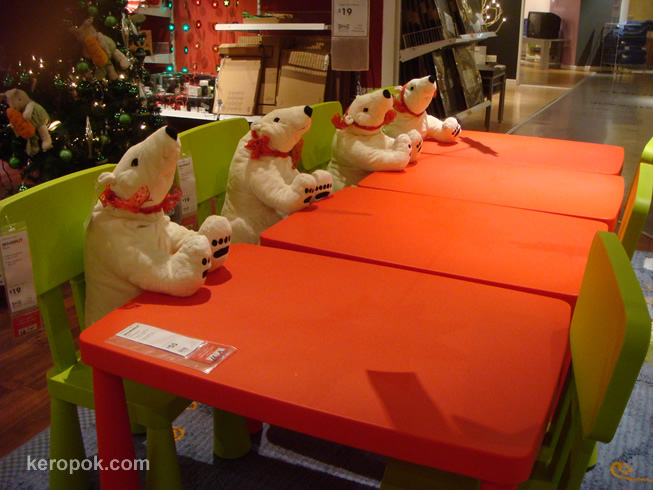 These bears looks so cuddly ya? 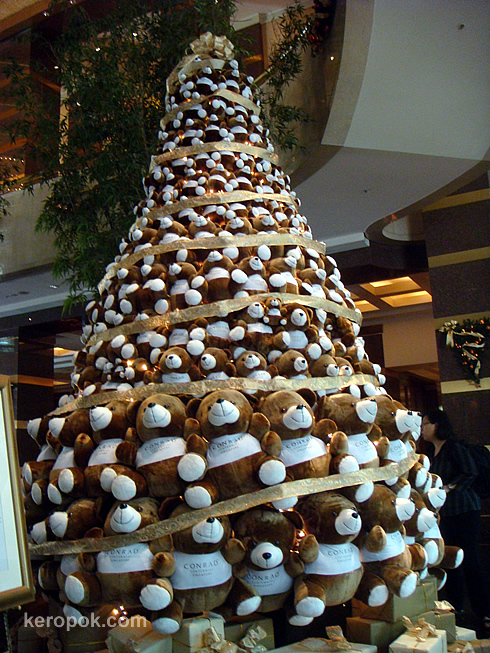 If you were a kid, would you love this tree? 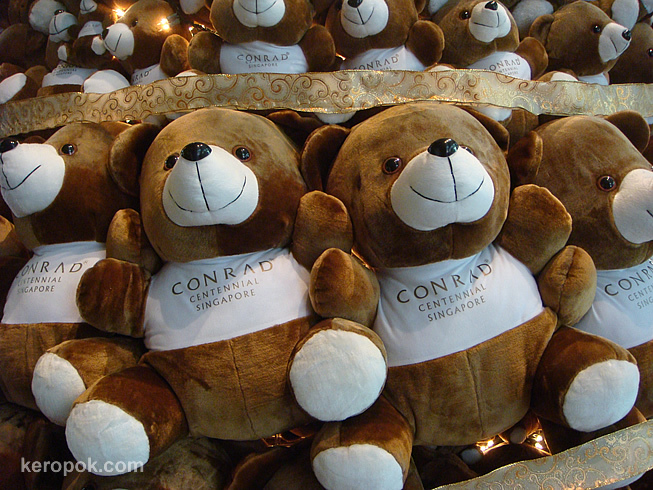 Are you a teddy bear collector? The words look blurish because I tried to take it behind a drop of water on the windscreen! haha.. I guess you can only see this sign in Singapore. Cars leaving Singapore and driving into Malaysia have to make sure they have at least fuel tank 3/4 full. Failure to do so will result in a fine! 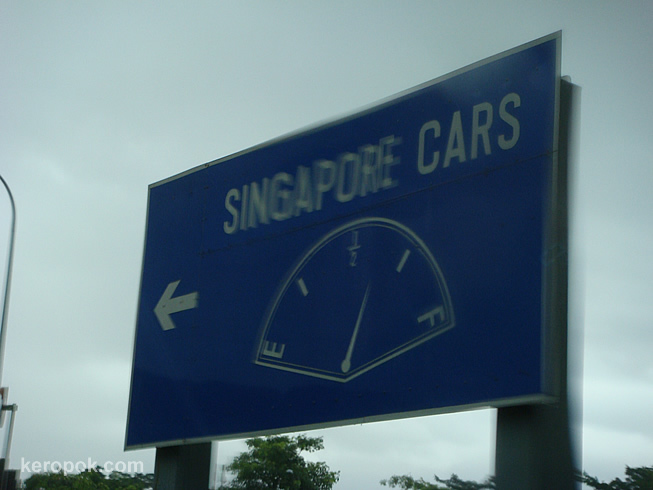 The sign tells the drivers to detour back to Singapore if you have less than the required 3/4 tank of fuel. These two are additional photos taken at the Lego event yesterday. The lego "brain" is connected to the PC to programme. 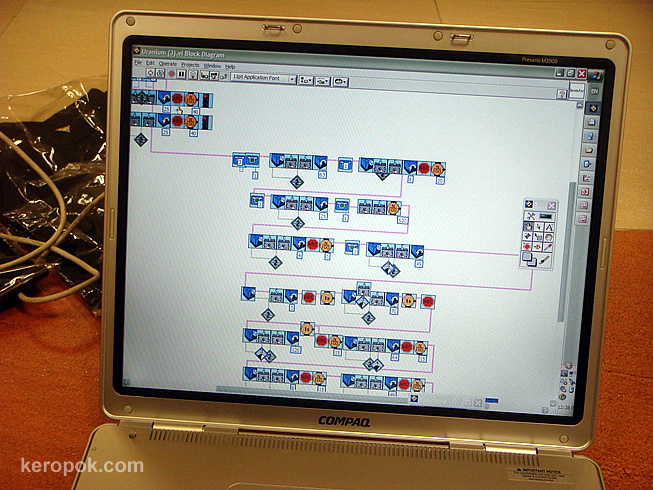 I took another snapshot of how the programming interface looks like from another machine. The kid said sure, take a photo of it. One look, I was in awe that programming is needed for toys. Maybe one of these days, I should try my hand on it! Yesterday after lunch, colleagues and I, we went over to the premises of the School of Computing, NUS to be 'busybodies'. There's a Lego League Competition going on. We were quite impressed! When I was in primary school, lego meant ordinary legos. 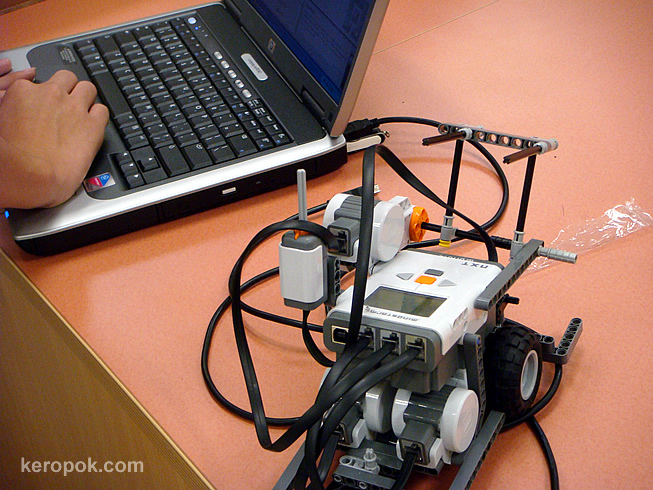 This kids are programming robotic legos! Did you as a kid also admired your neighbour's invention, just like this kid here? Oh man... my lego sure did not look like this when I was young! 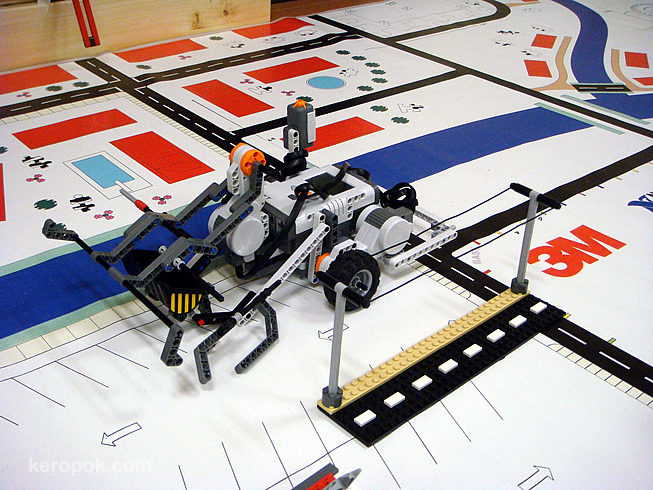 This is programmable and can move according to what was programmed into it! So... did you play with Lego when you were young? These pictures are so fresh from the oven. The SoC Infocomm Fest 2007 is a series of events targeted at youths from the age of 9 to 25. 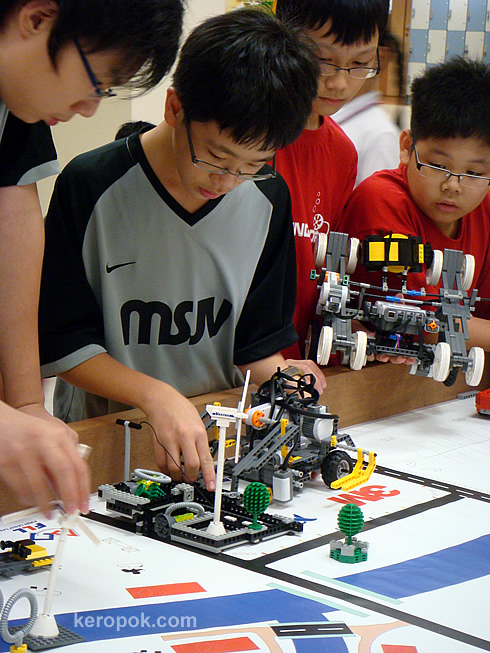 I am so interested to look at the LEGO league. Let me try to get some photos of the LEGO event. 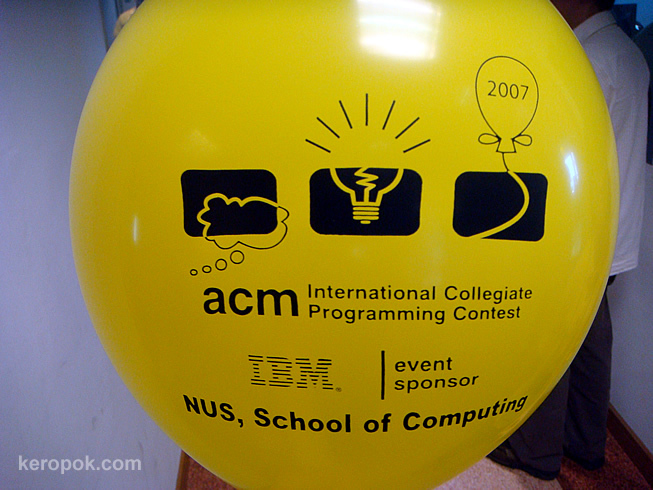 Here are some photos of students cracking their heads for the ACM ICPC at around 11 am. The results will be known tonight at the University Cultural Centre from 6 PM. After posting yesterday's photo, I realise I took a similar shot at Vivo City too just one or two weeks ago. You can see the roof top 'playground' of Vivo City on this picture as well. I guess the brands here are different from the ones yesterday. How many products from the brands do you own? 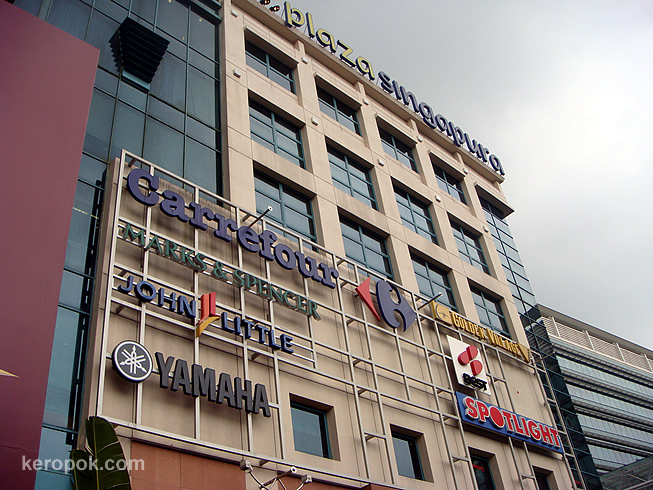 This is one popular mall along Orchard Road. 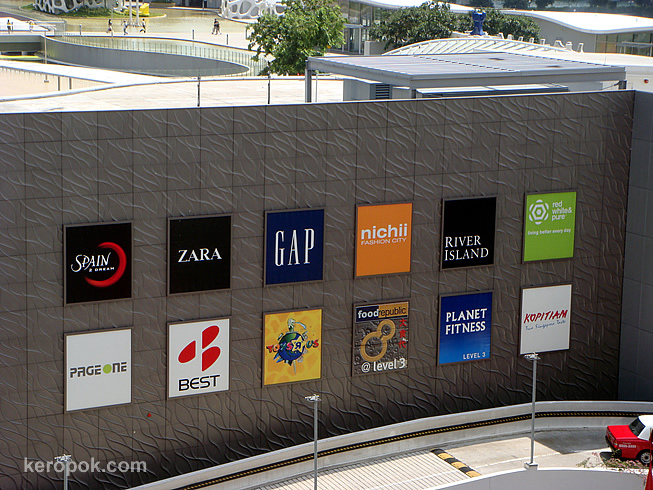 This is part of the front wall where it has the name of the shops on it. Can you name where the brands come from? Is there any favorite of yours listed? 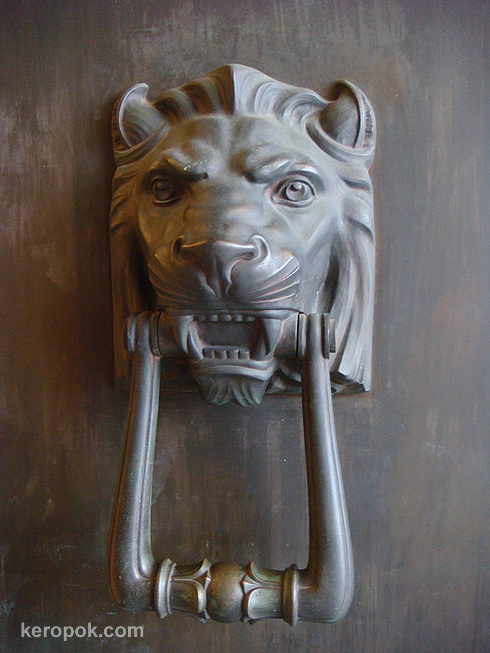 Spotted at the big huge doors at City Hall. 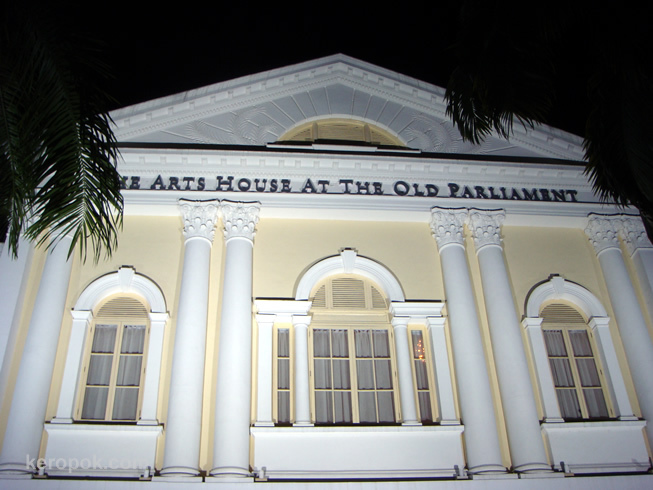 More about visiting this place at the Uniquely Singapore Website. 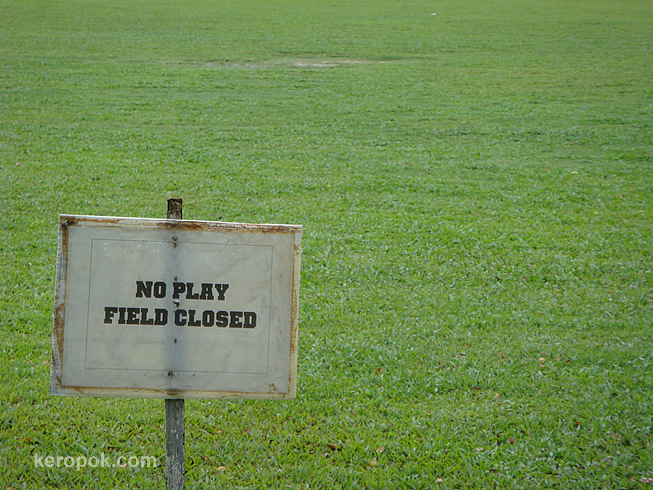 Spotted at the NUS Field: No Play Field Closed. It has been raining for the past weeks and the field is soft and muddy. Has it been raining where you are living? It has been raining and everyone's getting really moody! Paris Daily Photo posted a photo of Hunch Bak of Notre Dame a few days ago. 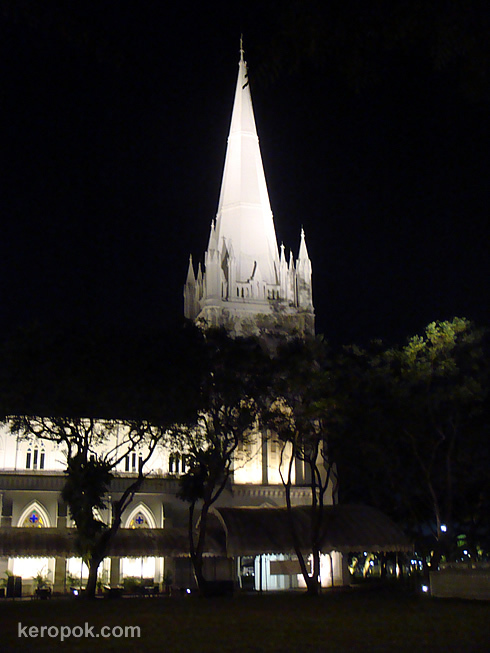 I happen to take this photo of St Andrews Cathedral in Singapore. Not very similar, but since I took a photo of it, here it is. Looking at their website at www.livingstreams.org.sg, I realise that they have a Welcome Centre and it organizes tours. One of these days I might just take a tour inside, or ask my colleague who worships here for a personalized tour. 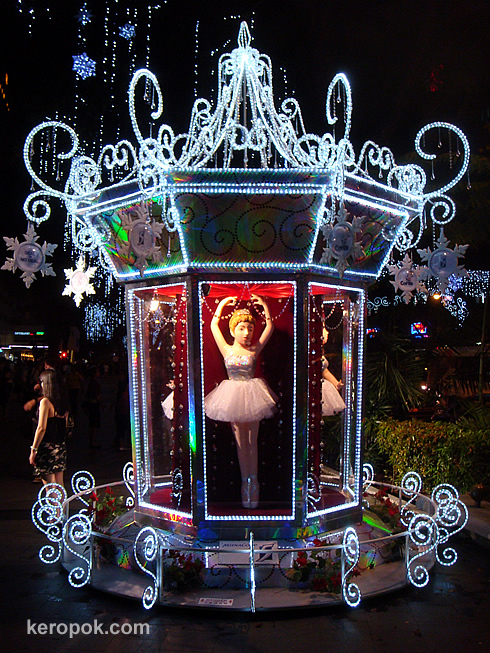 If you are in Singapore or happen to visit Singapore between 15 - 25 December, take time to enjoy performance by various groups from local and overseas churches along Orchard Road. For more info, visit the Celebrate Christmas in Singapore Website. A "picture tells all" post. 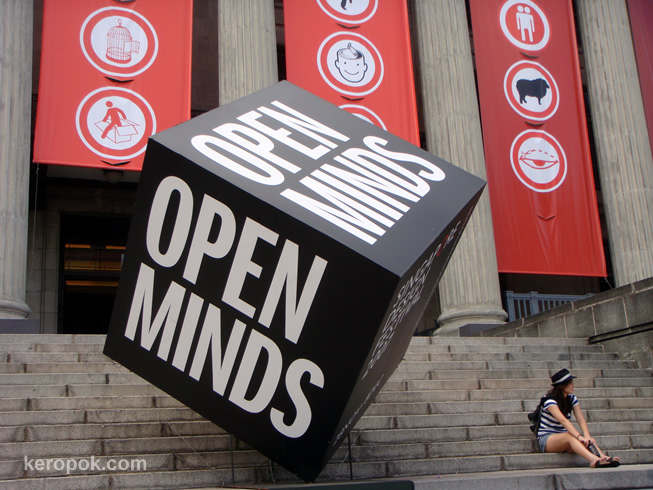 This is also spotted along Orchard Road this week. It's the Annual Boys' Brigade Sharity Gift Box. An excerpt from their website at www.bbsgb.org.sg explains it all. For 20 years, The Boys’ Brigade has been seeking to bring cheer to the less fortunate by collecting food items and fulfilling Christmas wishes of the beneficiaries through The Boys’ Brigade Sharity Gift Box. These gift items reach out to more than 180 Voluntary Welfare Organisations and 3,000 individuals under the Public Assistance Scheme. This project is all about YOU! 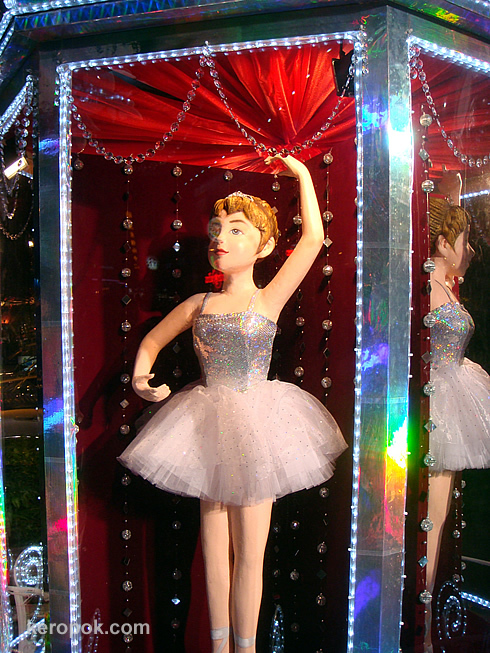 You can make someone’s wish come true this Christmas! This is a unique project as donors are encouraged to go beyond purely financial giving and are instead challenged to make the extra effort to buy gifts for the less privileged in our society. Local Broadcaster ChannelNewsAsia also have an recent write up about it here. So, for yourself personally, do you often help or give to the underprivileged? 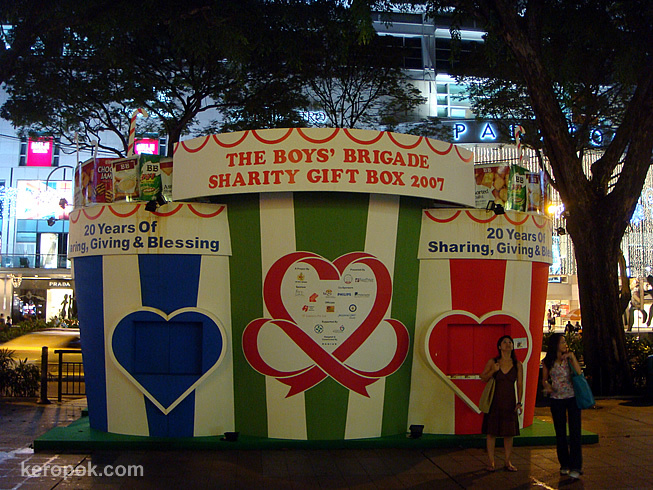 For the locals reading this, if I am not mistaken, you can go to any of the Fairprice Supermarkets and they have this box manned by the Boys' Brigade where you can buy stuff and pass it to them. Saw this on Orchard Road earlier tonight. Remember to recycle! Do you recycle your stuff? Here's a good site to visit: Singapore Environment Council. 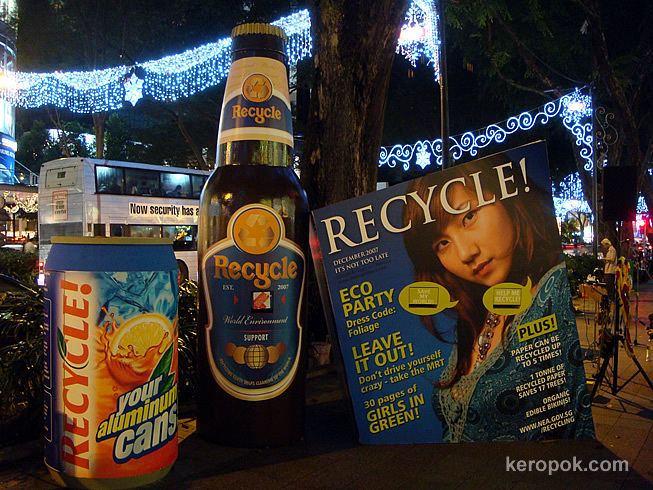 People in Singapore, this link is particularly useful if you are interested in Recycling. Wow, doesn't it look nice? 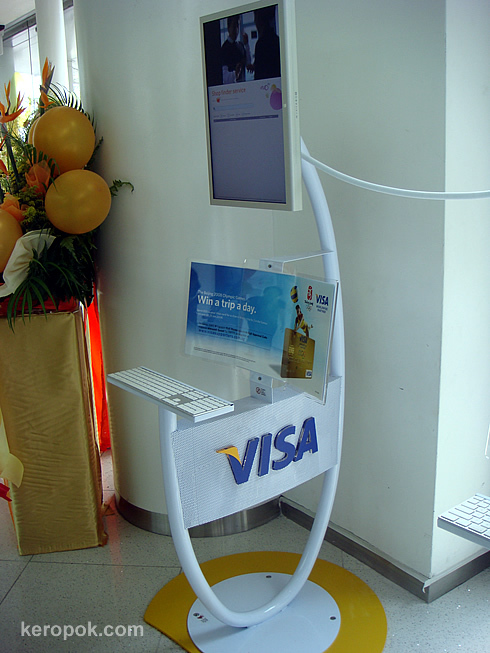 Vivo City, one of the newer shopping mall in Singapore recently had this new information kiosk that's also a Visa Card promo kiosk. 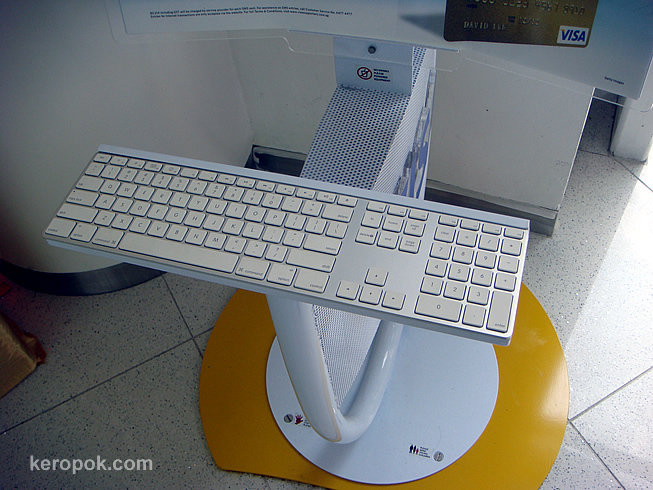 Look, they are using high resolution Apple Monitors and the new slim Apple Keyboards. There are a few of it side by side as well. I guess the Apple products looks so good, they do not really need to mask it up. 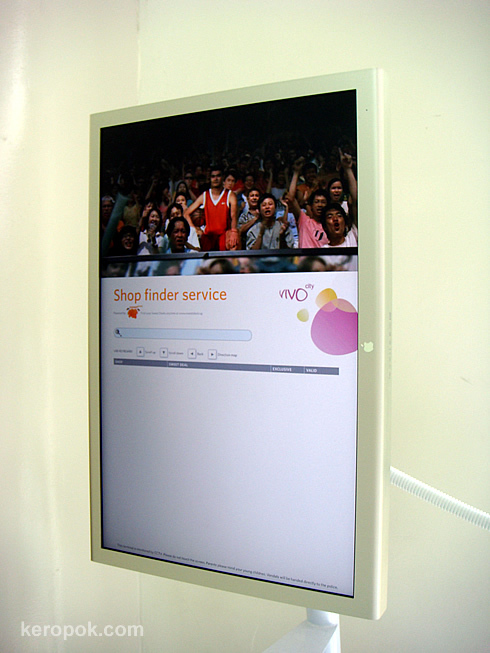 Most kiosk have the monitor enclosed in some boxes. So... Do you own any Apple products? 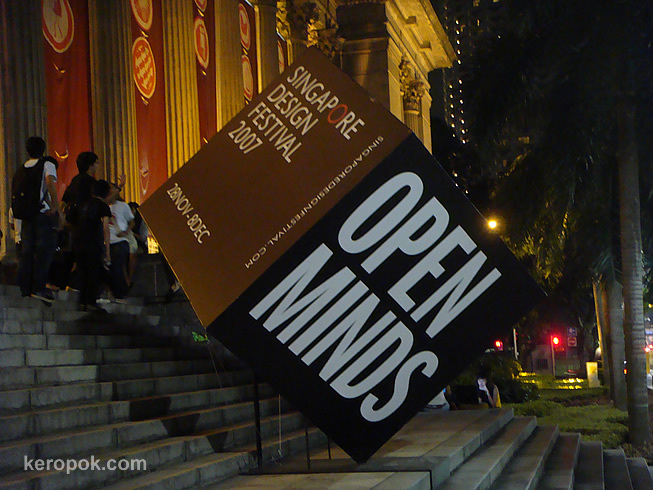 Anyone who loves things with interesting or good design should visit the Singapore Design Festival 2007. I was there last weekend and went through a few free (yes, free) exhibition. There are also paid exhibitions, but we were too tired to go through it and we were suppose to meet friends for dinner. Well, if you are interested, you have until 8 December to catch the festival. 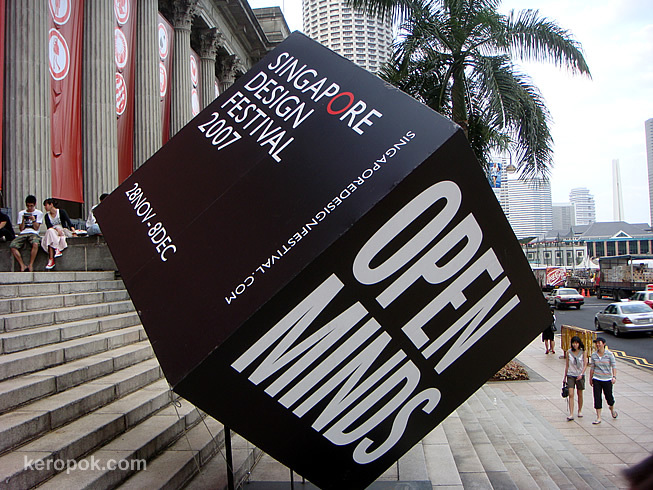 The Falling Cube at the entrance of City Hall, where most of the exhibitions are held. I took this on Friday nite, 30 Nov.
Then I was thinking, Open Mind.. so I did! I took out my brains and waited till Sunday 2 November for daylight to take another shot of it. 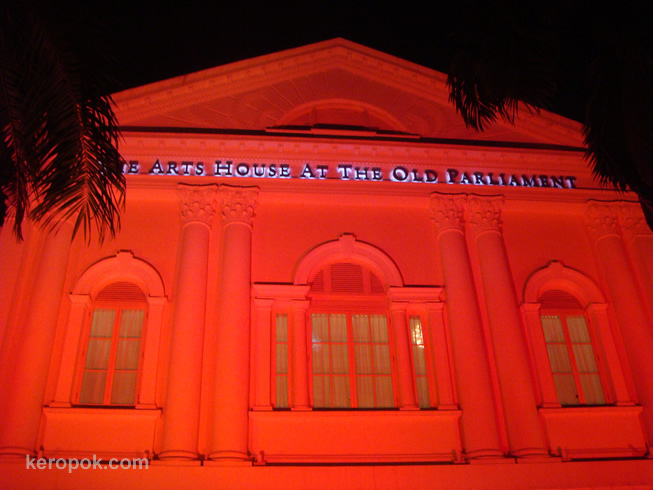 I think it is an attention seeker thingy when buildings shine different colour lights to its walls. Well, for me, I have this tendency to stand there and gaze at it until the full cycle of colours finishes. Here's some colours that I manage to capture on my camera a few nights ago. 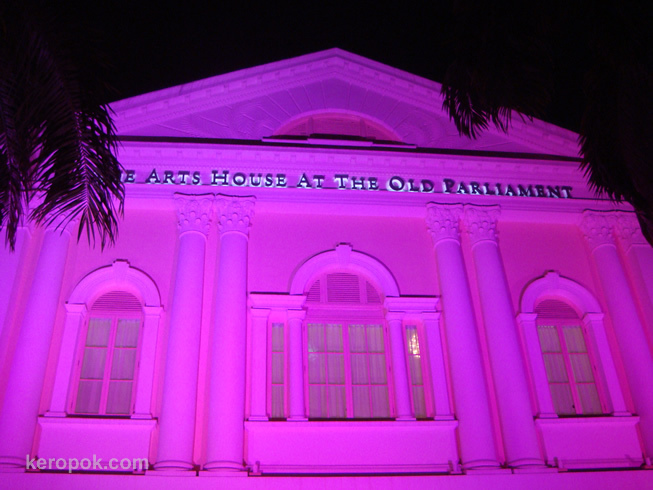 By the way, if you are interested, head down to this very building for the Singapore Writers Festival. 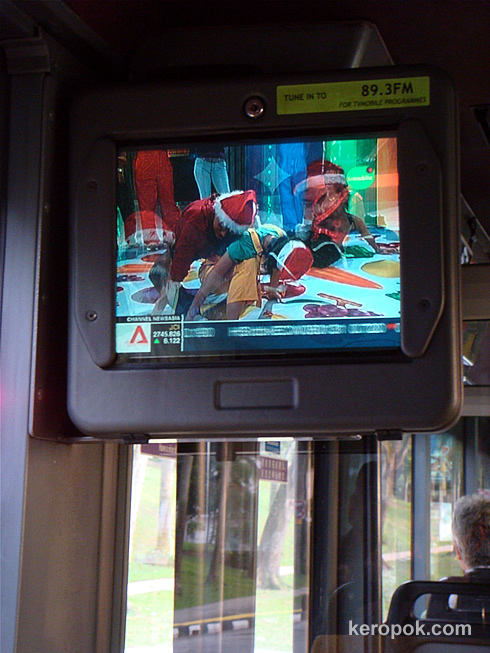 It runs from 1 - 9 December 2007. Talking about Writers, who is your favourite writer? 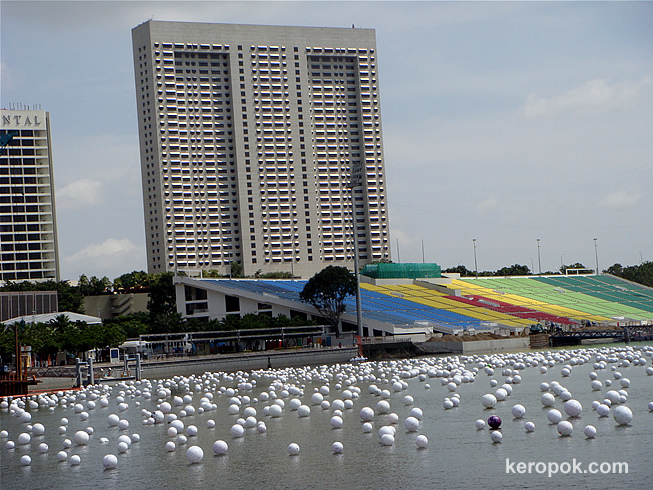 This morning, thousands in Singapore ran the Standard Chartered Singapore Marathon 2007. No, I was not one of those who ran. I know a few friends who did. 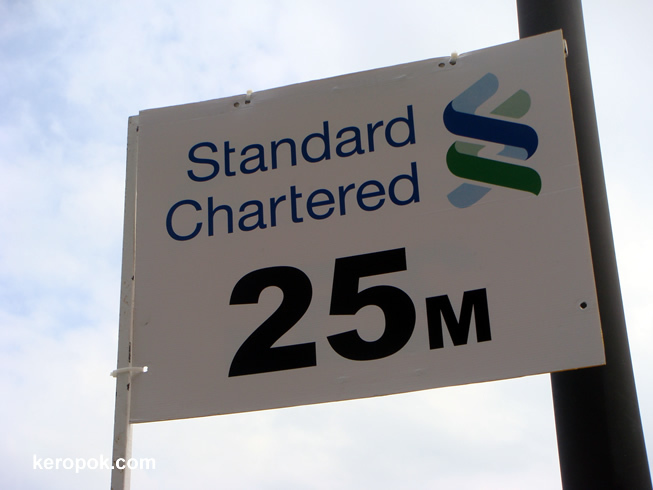 So, here's a photo of the last 25M marker. Who won? The Kenyan and Ethopians won the Top 5 each for the Mens and Womens Full Marathon. Congratulations! Mr & Mrs J&J Lee, hope you all finished the race! Today is the 1st of December, and it is Theme Day for the worldwide City Daily Photo bloggers again! This month's theme is Bridges. What bridge am I showing? 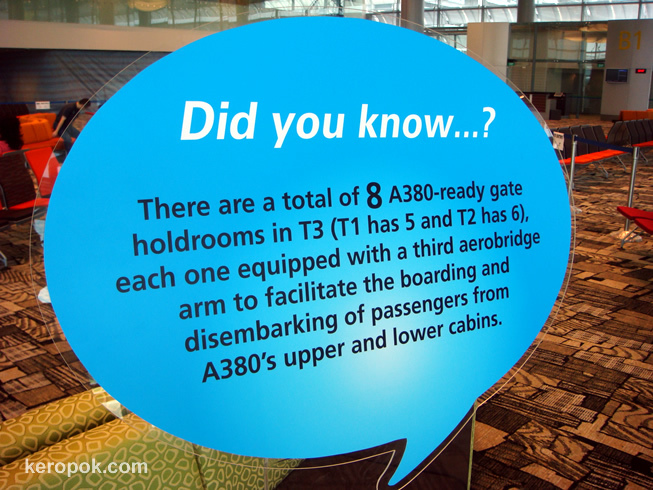 A brand new aerobridge at Singapore's Changi Airport Terminal 3. This new terminal will officially open on 9 January 2008. The ones above I think are not the ones for the A380 planes. It only has 2 arms. 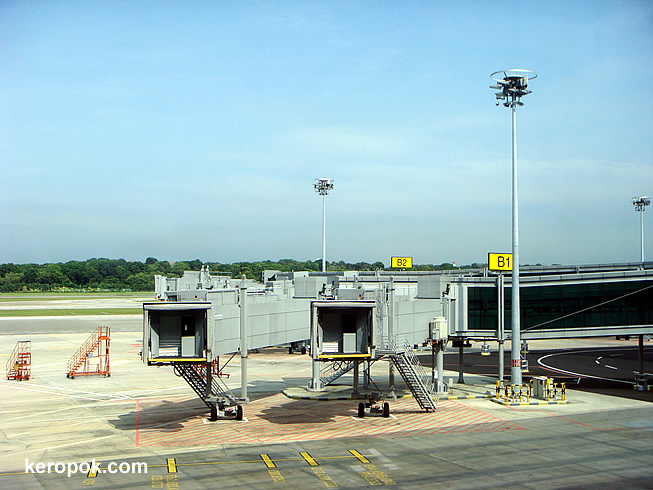 I have photo of the 3 arms aerobridges, but they are not very clearly taken. I wonder if Sally from Sydney DP will be flying over to Singapore to escape the summer heat? haha.. Currently the airline that flies the A380 is Singapore Airlines and the route from Singapore to Sydney is the only route with the new Airbus A380 planes. When was your last flight and which airline did you fly with? My fellow Daily Photo Bloggers around the world are also participating in the Theme Day. See how the theme is being interpreted in different cities.